1978 TURCHIA - 5 Lira Ataturk (Cat. World Coins KM.905) Splendida conservazione FDC - Tiratura 76.000 pz. 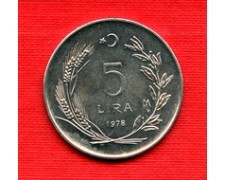 1978 TURKEY - 5 Lira Ataturk (Cat. World Coins KM.905) Stunning Conservation FDC - Circulation 76,000 pcs.